dvratil updated subscribers of T9423: [KMail] Better account quota reached warning. @mlaurent could you please add a reference to commit(s) that implemented this for future reference? mlaurent edited projects for T9423: [KMail] Better account quota reached warning, added: KDE PIM (Applications 19.04 (master)); removed KDE PIM (Applications 18.12 (master)). mlaurent edited projects for T9423: [KMail] Better account quota reached warning, added: KDE PIM (Applications 18.12 (master)); removed KDE PIM. maciejn removed a watcher for KDE PIM: Junior Jobs: maciejn. knauss moved T8408: Autocrypt support for kmail from incoming to Technical on the KDE Privacy Goal board. knauss added a project to T8408: Autocrypt support for kmail: KDE Privacy Goal. knauss removed a parent task for T8408: Autocrypt support for kmail: T7050: Privacy Software. dvratil added a comment to T9420: [KOrganizer] Improve event display. Thank you for all your work so far! ognarb placed T9420: [KOrganizer] Improve event display up for grabs. I don't have much time now, so if someone want to clain this task instead you are welcome. domson added a watcher for KDE PIM: Junior Jobs: domson. ognarb added a comment to T9420: [KOrganizer] Improve event display. Hello, I very busy lately. I hope I will have more time to finish this task, during the holidays. mlaurent moved T9423: [KMail] Better account quota reached warning from Backlog to In Progress on the KDE PIM board. There's Prefs::createNewColor() in eventviews/src/prefs.cpp, looks like that might be it? Sory for the delay, I distro hopped from arch to openSuSe and I have some trouble with building from source with openSuSe (libkleo and some other dependencies don't want to build). 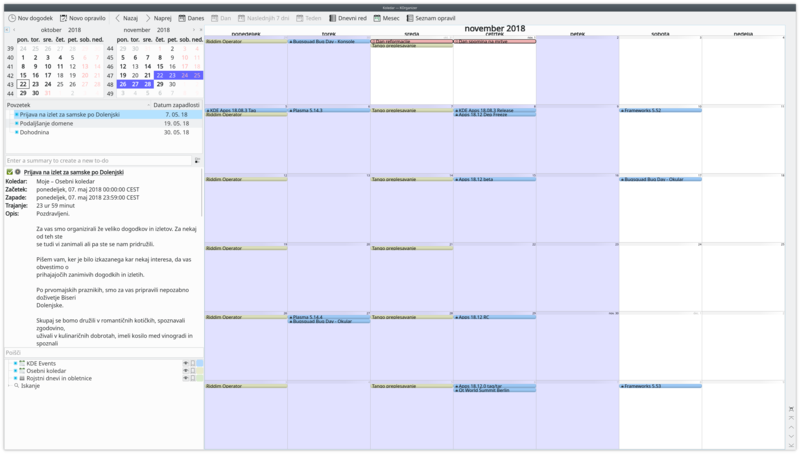 And I also have trouble finding where the color is generated (the calendar is generated in korganizer:src/akonadicollectionview.cpp, but I have trouble finding when and where the color is set). ngraham added a comment to T9420: [KOrganizer] Improve event display. @dvratil Do you have some other improvement suggestion? I was thinking about changing the default color to a pastel green color (#BAED91) but otherwise I don't know that can be improved anymore. ognarb added a revision to T9420: [KOrganizer] Improve event display: D16624: Improve contrast in header from agendaitem. ognarb added a comment to T9428: [Akonadi Console] Alphabetical sorting. I was looking at this task to learn how akonadi work and akonadiconsole crash directly after choosing a instance. It is a know bug? Should I create a bug report? dkurz added a member for KDE PIM: Junior Jobs: dkurz. ognarb added a revision to T9420: [KOrganizer] Improve event display: D16393: Add the config to use the system color in Korganizer (see D16377). @repinc interesting, but I don't have a HiDPI screen to test. I read in the internet that using QRectF,QPointF instead of QRect and QPoint should improve the situation. So I'm changing most of the occurence of QRect and QPoint. I also found out that the item height is hardcoded in function of MonthCell::topMargin to an height of 18px, but I have not idea how to access the pixel ratio. repinc added a comment to T9420: [KOrganizer] Improve event display. ognarb added a revision to T9420: [KOrganizer] Improve event display: D16377: Using the system palette for drawing the month- and agendaitem..
@ognarb That sounds like a good idea: you can use it to get information about background and foreground colors and calculate some reasonable color palette from that. @dvratil Do you think, it's a good idea to use QStyle for the color. Because for the moment it's difficult to choose a color palette that look good with breeze, breeze dark and some other themes. And then add button to activate this feature, so that someone can also choose the color manually like before. @repinc, could you please attach a screenshot? There is another thing to look into with with month view rendering. It looks like it does not respect the DPI and does not look quite right on HiDPI screens. The bars ae just too narrow and height does not react to larger font size. @dvratil I not really good with choosing color. But with some input from the VDG, I can probably change the default color. I will first work on the day/hour lines. Flat items and less rounded corners are already in git master (for 18.12). We can wait for the improvements in the color palette to be done first, then blog about the whole task if you want. How much of this has already landed? I only blog about things that are actually in. dvratil updated subscribers of T9420: [KOrganizer] Improve event display. dvratil updated the task description for T9420: [KOrganizer] Improve event display. dvratil closed D16013: Rewrite the painting of an month item. dvratil accepted D16013: Rewrite the painting of an month item. I think it's perfect now, so from my side, this is good to go. I don't think this kind of change belongs to a bugfix release, so I'll push this to master (for 18.12 release). ognarb updated the diff for D16013: Rewrite the painting of an month item. dvratil added inline comments to D16013: Rewrite the painting of an month item. ognarb added a comment to D16013: Rewrite the painting of an month item. dvratil added a comment to D16013: Rewrite the painting of an month item. Sorry for the late update, I had exams. So I rewrote this differential a little bit and removed some change. dkurz added a comment to T9429: [Akonadi Console] DB Console improvements.